Your lawn requires a lot of care if you want to keep it looking healthy and green all year long. It needs fertilization, proper watering and continual inspections to ensure that it is not suffering from pests and diseases. Preventative maintenance and treatments can protect your lawn from many of the problems that can damage it. Here are a few tips to help you keep your lawn looking its best. Over-watering is just as serious of a problem as under-watering. Wet the ground until about 3/4-inch is wet. This stimulates root growth without encouraging disease, pests and other issues. 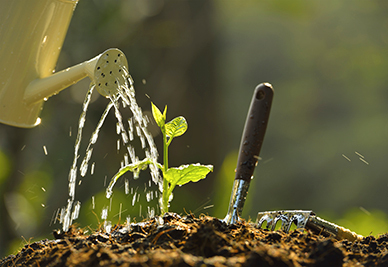 Wait until early morning to water to reduce the amount of evaporation that takes place and prevent fungus. Check out some more tips on how and when to water your lawn. Fertilizing your lawn is an important step to keeping it healthy. However, it is important to know what kind of fertilizer to use. The decision depends on the size of your lawn, what grasses grow there, the type of soil and drainage. This tells you what nutrients are already present and which ones may be lacking. To prevent drought damage to your lawn, keep it watered and set your lawnmower blade higher off the grass. This helps prevent the soil from drying out as quickly. Go into the dry season with a healthy lawn by having it treated by a professional. Beware of insects that can damage your lawn. They are most prevalent in the warmest temperatures, but can begin early in the spring. Even if you don’t see the insects, an unhealthy lawn is an indication of either an insect or disease problem and must be dealt with immediately. The easiest way to care for your lawn is by hiring the professionals who provide ongoing services to ensure that your lawn is healthy and lush. Natural Green Lawn Spraying uses natural products that are good for your lawn, the environment and you. With a complete lawn care program or shrub program, your landscaping can thrive in any weather. 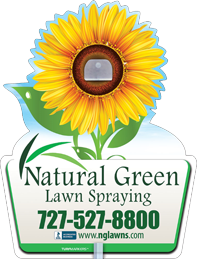 Contact Natural Green Lawn Spraying today at (727) 527-8800 to schedule an appointment for our technician to ascertain the health of your lawn and develop a program to enhance the look of your property.